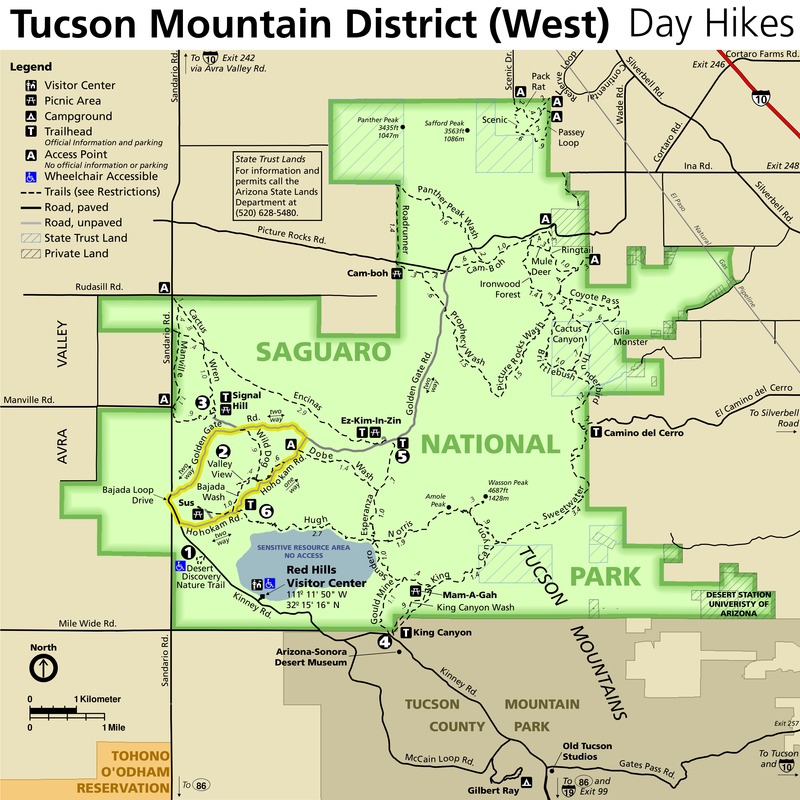 Most of the trails on the Northwest side of Saguaro National Park are a maze of trails with no apparent destination other than another trail. 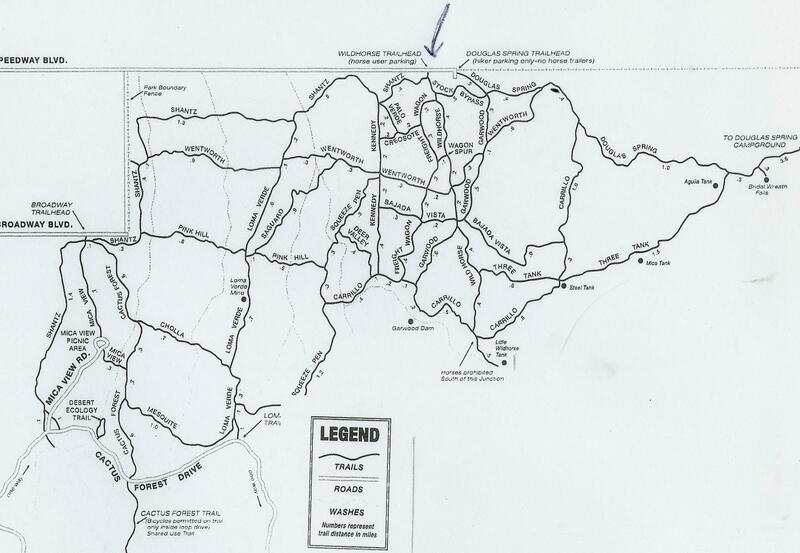 They form a network of trails that can be combined like Legos to make numerous different loop trails. 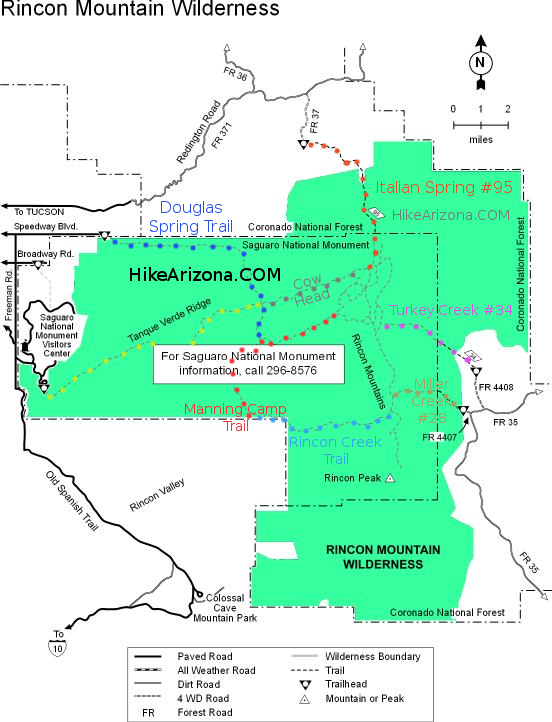 There are a few exceptions, The Douglas Spring trail with Destinations in the Rincon Mountains, Wildhorse Canyon Trail leading to Wildhorse Canyon pools and the Cactus Forest Trail, the Parks major north south trail. 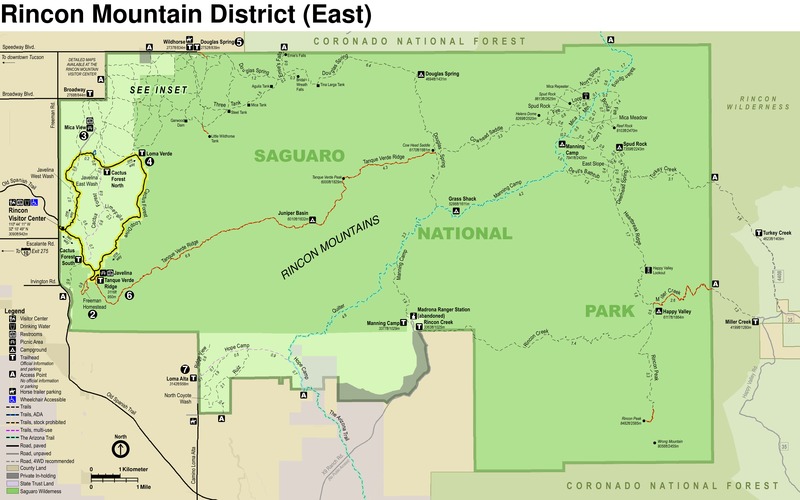 The cactus Forest Trail has its northern terminus at the Broadway Trail Head and southern terminus on Old Spanish Trail at the Irvington Trail Head. This trail follows almost entirely along the Javelina Wash water shed with the exception of the last mile near Old Spanish Trail. I consider this a ridge trail because it stays out of the washes except to cross them. From the Broadway Trailhead the trail heads south, crosses the Shantz Trail almost immediately and at 0.6 miles crosses Javelina Wash crossing over to the ridge on the east side of the wash. The Cholla Trail heads east from this trail at 0.7 miles, Mica View heads West at 1.0 mile and Mesquite Trail heads east 1.2 miles. Still on the ridge separating the Loma Verde Wash to the east and the Javelina Wash to the west, the Cactus Forest Loop Drive comes up at 1.8 miles. The trail crosses the Loop drive, and then follows on a ridge to the east of Javelina Wash East Branch. At 2 miles, just prior to crossing Javelina Wash East are the remnants of Cactus Shack, a storage shed built by the University Of Arizona to be used in conjunction with a telescope that was to be placed on the hill just east of this shed. The Telescope was never installed. The Shed was later used by the CCC during Park development and in 1936 it was converted to a ranger’s residence. The structure was leveled in 1960 only the foundation remains today. 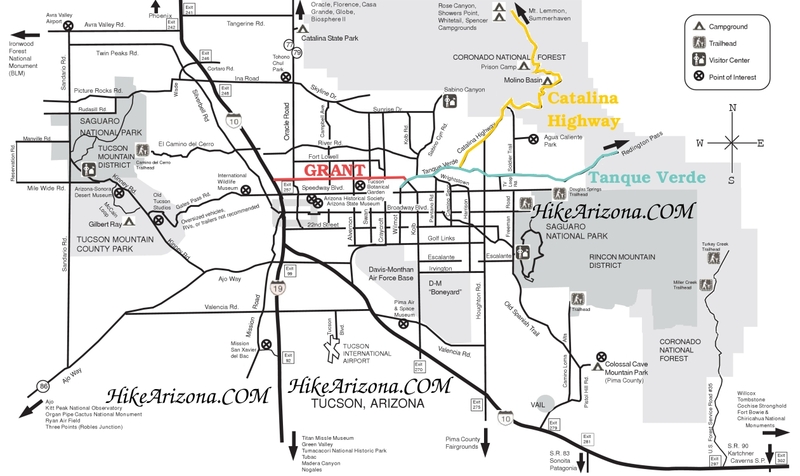 The trail now is approaching the hills just below Tanque Verde Ridge and it is at this point 2.7 miles that you come to the location of the Lime Kilns and the Junction with the Lime Falls Trail. During the 1880’s the kilns supplied Quicklime for construction needs in Tucson, The limestone came from the hills just east of this site and Mesquite trees provided the fuel for the kilns. Just off the trail a few yards is one of these kilns. From here the trail climbs a small ridge separating Javelina Wash East from Javelina Wash West. Javelina Wash West is crossed at 3.6 miles and Cactus Forest Loop Drive is crossed at 4.2 miles. Cactus Forest loop Road travels along a ridge that separates the Javelina Wash water shed from the washes west of the loop road that flow west toward Spanish trail. The Cactus Forest Trail from the Loop Road to Old Spanish trail is quite different from the trail so far, the smooth trail gives way to a less maintained and rockier trail. This is probably due to the fact that it is not as heavily travelled. This is a nice trail to take if you want a change from the maze of trails on the far northwest portion of the Park. Bicycles are allowed on this trail only on the inside portions of the Cactus Forest Loop Drive.